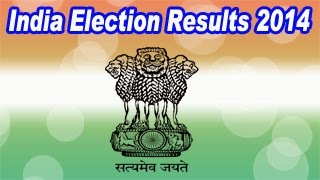 Vote counting is done today (16 May 2014), and the results of India General election 2014 got declared by the election commission. This election gives major victory for NDA ( National Democratic Alliance ) led by BJP (Bharatiya Janata Party) over the ruling UPA (United Progressive Alliance)led by Congress Party. Watch the below video which shows Headlines from various Media site about the Results of India Elections 2014. The current Opposition party BJP wins enough seats to form government. It seems BJP's prime ministerial candidate Narendra Modi will take oath on May 21. Narendra Modi contested from Varanasi in Uttar Pradesh and Vadodara in Gujarat. He won from both constituencies. Infosys co-founder and Billionaire Nandan Nilekani contested from Bangalore South constituency as Congress Party member, and he lost the election. India's former army chief general VK Singh won from Ghaziabad constituency of Uttar Pradesh. Veteran BJP Leader LK advant won from Gandhinagar constituency. BJP's Sushma Swaraj wins from Vidisha. BJP's Varun Gandhi wins from Sultanpur in Uttar Pradesh. Tamil film actor superstar Rajinikanth conveyed his wishes to Modi through Twitter, he described Modi's victory as historic. Modi will be the first Prime Minister of India born in independent India. He will also be the first Indian prime minister whose mother will be alive when he takes office. He holds the record of winning a Lok Sabha seat by the highest margin (about 5.70 lakhs; Vadodara). In the history of India, this is the first time a non-Congress Party has secured a clear majority. We can see the election trends and results here and watch Videos here to get the updates immediately. And, we can check the election trends and result at Election commission website also.It provides partywise and Constituencywise trends. The 2014 general election was conducted in nine phases in India from 7 April to 12 May 2014. This election is the longest election in the country's history of India. This election is to constitute the 16th Lok Sabha. Lok Sabha is the lower house of the Parliament of India. It is composed of representatives of the people from 543 constituencies. A Total of 131 Lok Sabha seats are reserved for representatives of Scheduled Castes (SC) and Scheduled Tribes (ST). According to the Election Commission of India (ECI), the electoral population in 2014 is 814.5 million, the largest in the world. EVM (Electronic voting machines) were used for conducting this election, and people are expecting to have online voting in future. As per Indian constitution Elections must be held at an interval of five years. Current Prime Minister Dr. Manmohan Singh is not contesting this election, and he declared that he is not looking for another term. He already served two terms, i-e 10 years as prime minister of India. Congress party President and UPA chairperson Sonia Gandhiis contesting from Rae Bareli in Uttar Pradesh (UP). Her Son and Congress Party vice-president Rahul Gandhi is contesting from his constituency, Amethi. Gujarat Chief Minister Narendra Modi was selected to lead the campaign of Bharatiya Janata Party(BJP), and he is the prime ministerial candidate of BJP. In 2005, Narendra Modi was denied a diplomatic visa to the United States of America. In addition , U.S revoked the B-1/B-2 visa that had previously been granted to him, by referring the U.S. Immigration and Nationality Act which prevents giving Visa to the persons who are responsible for violations of religious freedom. Aam Aadmi Party founder Arwind Kejriwal is competing against the BJP's prime ministerial candidate Modi from Varanasi. India is the 7th largest country by area and 2nd most populous country with more than 1.2 Billion people. And, India is the most populous Democracy in the world. India is a federal constitutional republic governed under a parliamentary system consisting of 28 states and 7 union territories. India strongly believes in Unity in Diversity. India is known as land of spirituality and philosophy. We can check the exit poll results at below links. 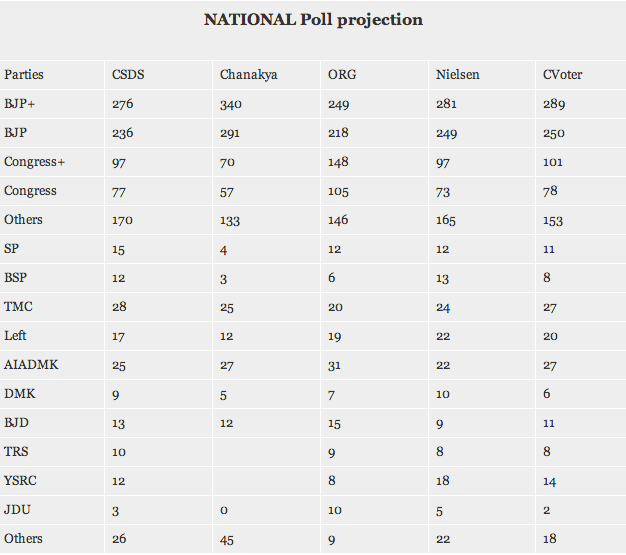 Almost all the Exit polls are predicting clear victory for NDA ( National Democratic Alliance ) led by BJP (Bharatiya Janata Party) over the ruling UPA (United Progressive Alliance)led by Congress Party.